You see it on bumper stickers: Practice Random Acts of Kindness. You hear the heartwarming stories on social media. It can also be called Pay It Forward, presumably from the movie of the same name. My brother and his sweet family performed RAKs over Christmas time. They left a little note with a candy cane on people’s cars or in their mailbox. They also left gifts at people’s houses without saying it was from them. In fact, another friend and I received a cryptic text from a friend saying, “I know it was one of you!” The friend informed her that it was not us but she knew who it was and she wasn’t telling. My brother and his wife want their children to get into the spirit of giving at Christmas and not just receiving. Since hearing that story I have been inspired me to pay for the person behind me in a drive through line. Once I paid for a policeman in line behind me at Chik-fil-a, and more recently it was at Starbucks. The one at Starbucks was *really* random. The gal at the check out window had misunderstood my husband’s order. She gave my husband a wrong drink. When she realized what she had done, she gave him the right drink but then in another misunderstanding she charged him for our drink and the car behind us. When she realized her mistake (the second time) she was really mortified. We just let it go and happily paid for the car behind us and were very pleasant to the cashier. She clearly was having a bad day! One thing that I appreciate a lot is when someone lets me out in traffic. I know it’s a southern thing and it happens a lot down here, but when I travel to other cities where that’s not the norm, it reminds me to be thankful for those little things. Or lets me get in line in front of them at the grocery store when I only have one or two items and they have a cart-full. I’ve done it myself for other people. It really doesn’t take much to put a smile on people’s faces. If you decide to participate in this positive movement, you can post your act of kindness on social media using #RAKWeek2015. 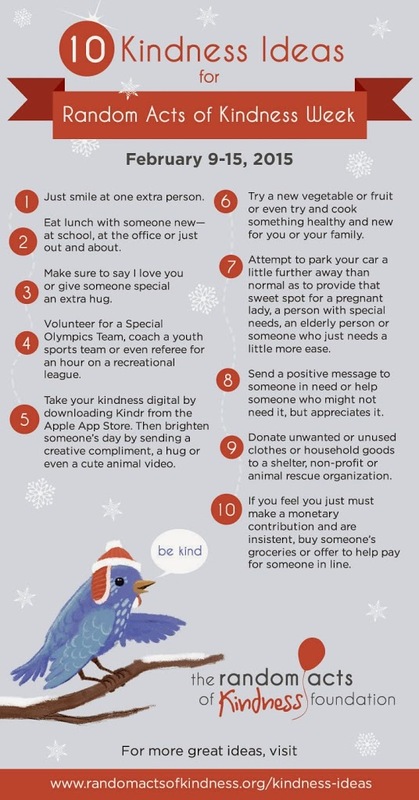 If you need ideas, check out the graphic below for 10 simple ideas of things you can do to spread good cheer. And then check out the Style Me Bloggers to see what kinds of RAK deeds they’ve performed to get more ideas! Great post! 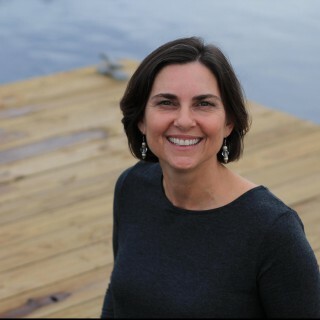 I agree with you, wouldn’t it be nice if random acts of kindness were the norm rather than something unique? Have a great weekend! It’s the little things that can make someone’s day…or ruin it for that matter! Thanks for stopping by Lana! Totally agree with you. This was an awesome post, so much insight! Why thanks Deena! Your comment was an act of kindness! 🙂 Made me smile! Thanks for sharing some great ideas for random acts of kindness! Love it! You and Jesus are so correct…it is better to give than to receive. My friend in Oklahoma City just told me about a similar story at a Chick-fil-a there. I have never been a part of paying it forward in a fast food drive through but that is going on my list for this coming week. I love the candy cane thing, that’s super cute and I bet the kids had fun doing that! I also pay for the person behind me in drive through sometimes, I’ve had it happen to me and it made my day!